Kitchen Window: Understanding The Brussels Sprout This humble cabbage relative is undergoing a renaissance. Cookbooks are full of conversion stories and recipes. Food writer T. Susan Chang shares hers: The delectable versions she now enjoys bear no resemblance to the boiled, greenish-yellow sprouts of her youth. Get recipes for Brussels Leaf And Baby Spinach Saute, Roasted Brussels Sprouts With Balsamic Vinegar and Creamy Braised Brussels Sprouts. "What are those?" I asked my mom, suspiciously eyeing the little cardboard tub with its cellophane cover. It held a heap of pale, miniature cabbages. "They're Brussels sprouts," she said. "They're supposed to be good for you," she added, sealing my doom. At dinnertime, the mystery vegetable reappeared, steaming hot and greenish-yellow but otherwise unaltered. It gave off a sulfurous stench. I recoiled, but I knew my job. I took a bite. Later, when my plate was clean except for the Brussels sprouts — now cold and, if possible, more repulsive than before — I was made to understand that they were now part of our routine, and I would have to learn to live with them. So I developed a strategy, which was to select the smallest piece I could and swallow it whole, as if it were a particularly large multivitamin, and I a Burmese python. Then I'd chase it with a swig of milk, which would effectively bury the fumes before I inhaled again. We are living through a Brussels sprouts renaissance. Suddenly, whole fresh stalks of sprouts ... are appearing at your local supermarket. Brussels sprouts recipes — accompanied by fervent conversion narratives — festoon every greenmarket cookbook. It's a miracle I made it to adulthood without anyone having to perform the Heimlich maneuver. When I became a parent, I resolved that no child of mine would ever suffer the same fate. But like my mom before me, I was seduced by the Brussels sprouts' impeccable nutritional profile. The New England winter is long, just as it is in Belgium, where the sprouts were first cultivated 800 years ago (hence the name). You cannot eat kale every night, though you can try. Brussels sprouts were available, not to mention attractively priced. And so Brussels sprouts we would have. Fortunately, being a cookbook reviewer in the era of Michelle Obama and the First Garden, I had more resources than my mom had. And, we are living through a Brussels sprouts renaissance. Suddenly, whole fresh stalks of sprouts, looking like green light sabers covered in pompoms, are appearing at your local supermarket. Brussels sprouts recipes — accompanied by fervent conversion narratives — festoon every greenmarket cookbook. T. Susan Chang regularly reviews cookbooks for The Boston Globe, NPR.org and the cookbook-indexing website Eat Your Books. She's the author of A Spoonful of Promises: Recipes and Stories From a Well-Tempered Table. For more information, visit her blog, Cookbooks for Dinner. To unlock the brilliance of the Brussels sprout, cooks have had to overcome a booby trap hidden within the vegetable itself. After prolonged exposure to heat, cabbage (or brassica) family members start to stink of hydrogen sulfide, as heat-activated enzymes go to work on the sprouts' nutritious sulfur compounds, or glucosinolates. Good things come in small packages, but so do glucosinolates. Because they are young and tender, Brussels sprouts contain more than their older cabbage cousins do. So cooking them is like raiding a spell-fortified Pharaonic tomb, or opening a bank vault protected by a time bomb. Once the heat is on, you have to work quickly and retain your presence of mind. If you do, a magnificent, nutritious payload can be yours for the taking. There are a number of ways to accomplish this. If you have the patience and dexterity, you can separate the little leaves so you can saute them in a flash. 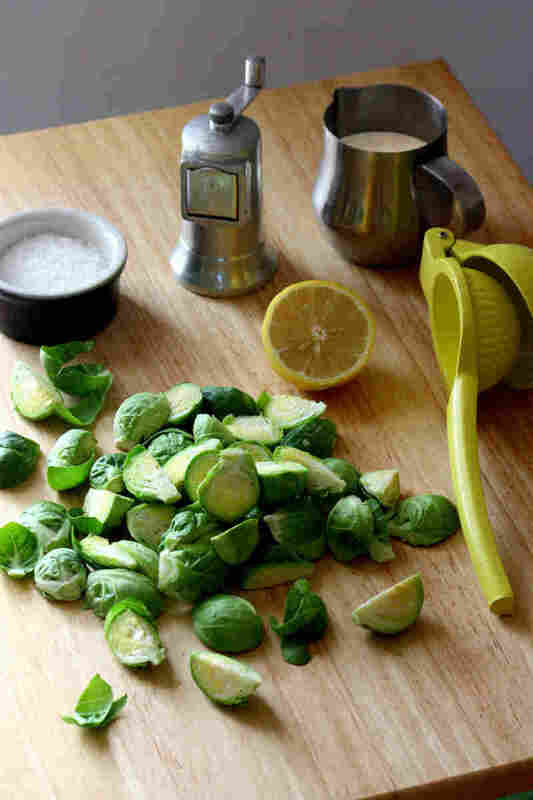 Or you can julienne the sprouts with a knife and then saute them. You also can set the time bomb on pause by roasting. The dry heat of roasting slows down the transfer of heat just enough to unlock the natural nutty sweetness in halves or quarters of Brussels sprouts, without triggering the odoriferous reaction. Or you can caramelize the sprouts and braise them in cream, which decadently emphasizes their sweetness while masking any sulfur effusions. Perhaps the worst way to cook Brussels sprouts is to Boil Till Dead, as if they were a lobster. This was the technique employed by my mother, an otherwise excellent cook. If you simply cannot stop yourself from boiling a brassica, you should strictly observe the seven-minute rule: never exceed seven minutes when immersing anything green in boiling water. 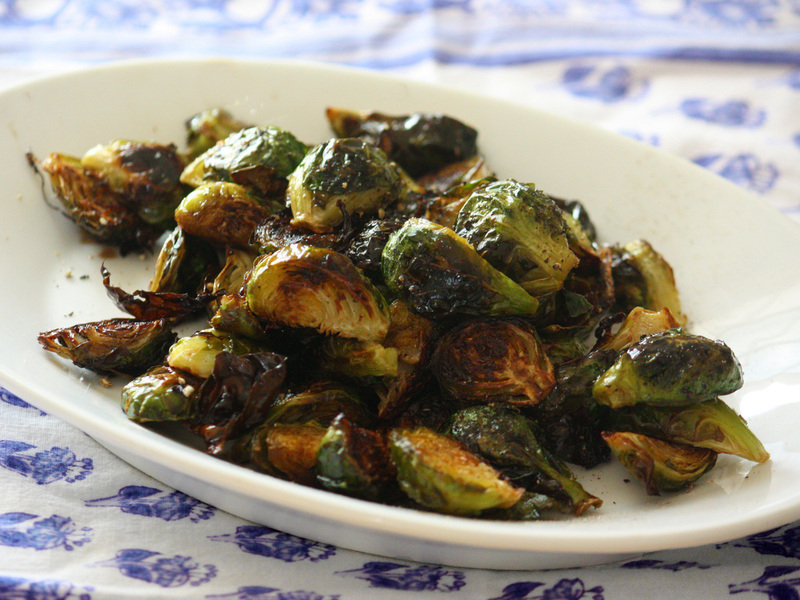 If things go well, you may hear a story like this: Somebody at my kids' lunchroom mentioned they hated Brussels sprouts. So said my 11-year-old, who has never had a boiled Brussels sprout in his life and knows nothing of my own haunted history. He paused, fork halfway to his mouth, and crinkled his brow. "Why would anyone not like Brussels sprouts?" This terrific recipe adapted from The Sprouted Kitchen (10 Speed Press, 2012) by Sara Forte, helped convince me to include it in NPR's Best Cookbooks of 2012 list. You can get more leaves off the sprouts by coring the heart with the tip of a paring knife. And you don't need to discard the core. Just throw it in with everything else. It's delicious. Working with one Brussels sprout at a time, peel each individual leaf, starting from the outside and working toward the middle. Continue to peel until you get to the tough core where it is just too tight to pull any more leaves. Discard the core and put the leaves in a big bowl. Repeat with the remaining Brussels sprouts. In a large frying pan, warm the olive oil over medium heat. Add all of the sprout leaves and saute for about 30 seconds. Add the vinegar and maple syrup, and toss to coat. Add the spinach to the pan and toss until it is just barely wilted. It is better just slightly underdone in this case, as it will continue to cook in its own heat. 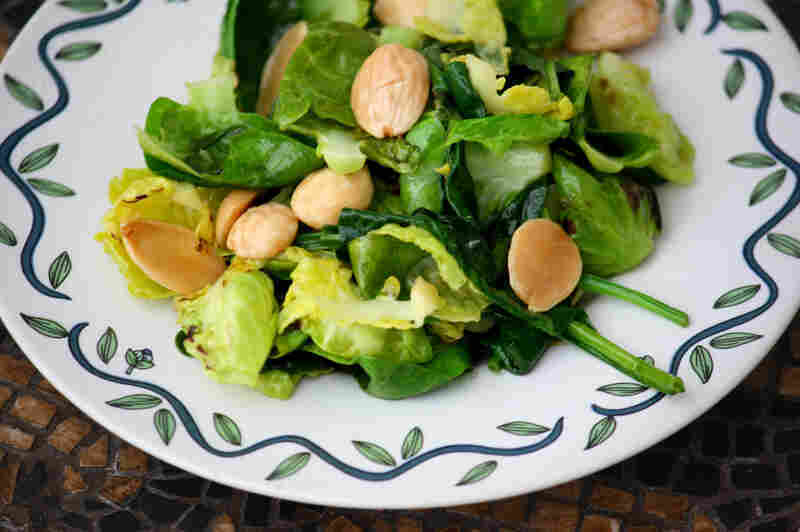 Sprinkle with the salt and Marcona almonds, and serve immediately. Covering the sprouts during part of the roasting prevents them from shrinking and drying too fast, and the balsamic vinegar complements their natural sweetness. Preheat oven to 475 degrees and line a baking sheet with foil (this helps with the cleanup). Trim the stalk end of the Brussels sprouts. 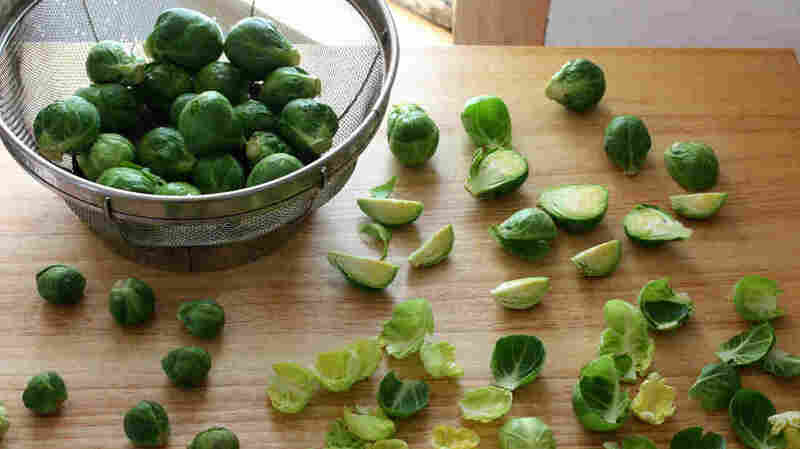 Depending on their size, cut them into halves, thirds or quarters (for thirds, simply halve the sprout unequally, and then halve the larger piece again). Toss them thoroughly in a large bowl with enough olive oil to make them glisten, but not so much it pools in the bottom of the bowl. Salt to taste. Dump the sprouts onto the baking sheet, spread or shake into a single layer, and cover tightly with another layer of aluminum foil. Roast 10 to 15 minutes (closer to 10 if they're about the size of an almond, closer to 15 if they're the size of a big olive). 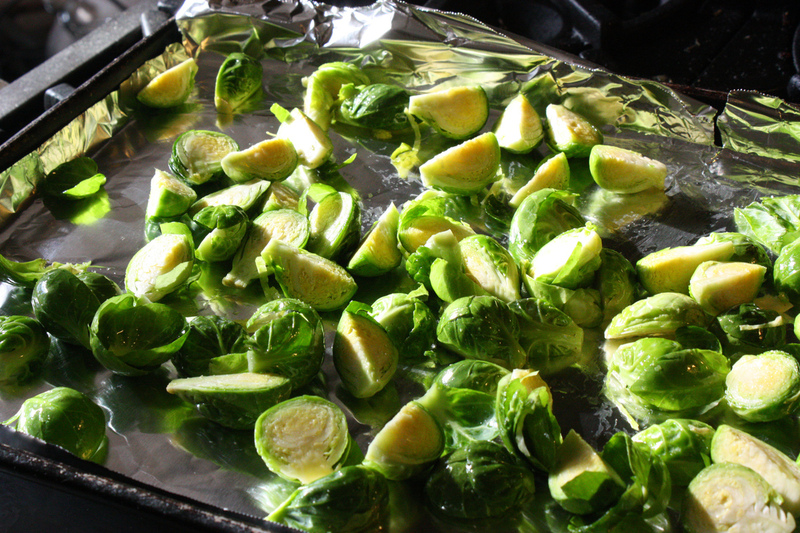 Remove the foil — the sprouts should be green on the outside, yellow-green in the middle and just starting to turn tender. Drizzle with the balsamic vinegar. Return to the oven and roast for 10 to 20 more minutes, checking in on them once or twice to stir and look for browning. When you see plenty of spots of golden-brown but none of the sprouts are completely brown, that's the time to pull them out. Grind plenty of fresh pepper over the sprouts. Serve immediately. This recipe (adapted from All About Braising by Molly Stevens, Norton, 2004), while perhaps not the most photogenic (it yields a creamy beige-and-brown mass that has to be tasted to be believed), has made converts of many. I asked Stevens why she thought it was that the sprouts remained sweet, nutty and un-cabbagey despite the longer braise, and she posited a number of factors: the fat in the cream, the halving (or quartering), the initial browning. Whichever it is, they're irresistible. With a paring knife, trim the base of each sprout. Cut the sprout in half lengthwise and remove any loose outer leaves. You can cut the halves into halves again if you want or just leave them. Melt the butter in a large skillet that you can later cover. Brown the Brussels sprouts over medium-high heat for about 5 minutes. Add the cream, some salt and pepper and stir. Reduce heat until mixture is slowly simmering. You want some bubbles in the cream, but don't let it boil too rapidly. Cover the pot and braise for about 30 minutes, or until sprouts are very tender. The cream should now be a pale brown color. Remove the cover, add the lemon juice and stir. Cook for another 2 to 3 minutes and serve.